Review: MilitAnt (PC) | "DESTROY ALL FANBOYS!" Do you consider yourself a game master? Do classic series such as Battletoads, Contra, Mega Man, and other vintage to modern platform toughies barely make you flinch when you speed-run them blindfolded playing with that controller in between your teeth? Well, you should be pleased to know MilitAnt has your name stamped on it in big neon letters. Xibablba Studios’ new PC and PS4 game (also headed to the Vita soon) is one of the hardest games of the year and it deserves a tip of the cap and old college try by the best of the best who should appreciate the gorgeously detailed visuals and non-stop challenge right from the start. Even on the lowest difficulty setting, the whopping amount of stuff trying to kill your little ant warrior is no joke. This commendable decision gives the game longevity and plenty of replay value, but may scare of casual gamers expecting a hand-holding mobile-like experience. You play a nameless ant warrior who’s part of a massive ant army gone to war against termites, wasps and other bugs big to small, but you’ll more than likely than not care more about surviving the levels than following the story. The game is billed as being “2.5D”, but what that really means is this is a side-scroller with a second plane enemies will attack you from every chance they get. Controls, movement and animation are solid, with an Xbox 360 or other game controller your best bet for survival. Keyboard and mouse do function extremely well, if you choose to go that route, but this is a game meant to be more fully enjoyed with a two stick analog. You can carry up to four different weapons of any type (once you unlock them) into battle, so choose wisely. The dozen weapons are excellent for the most part, but you’ll need to be careful as they all have a reload/cool down period. Knowing when to swap guns or use melee attacks is key, as enemies appear in large enough numbers to overwhelm even the most prepared player. In addition to waves of enemy bugs dropping in to ruin your day, the bosses here are simply astounding in their size and resilience. Thanks to your ant ONLY having a small life bar (that never gets bigger as the game continues as far as I’ve played), the very first boss took me an eternity to kill and about as many retries I could stand over an hour of trying. Granted, this was due to having the same four guns equipped, but it made for some screaming at my laptop at one point when that boss’ lifebar was down to one hit left and my poor ant-y got squashed like a bug. The funny thing is, that same boss you fight pops up on the next stage as a mini-boss, but you’ll have better weapons and it goes down somewhat faster. The impressive thing is Xilbaba knows how to keep you on your toes always expecting something huge and pissed off to enter the play field after a long battle. Copious checkpoints keep things from getting too maddening and the game is one that won’t be blown through in two hours with every secret uncovered. That said, you can absolutely speed-run the game once you practice enough to survive insects and other hazards doing their level best to do your ant harm. Presentation-wise, the CG cinemas and artwork are lovely and kick things off in a good way with large, detailed models and sweeping camerawork that gives the game an almost licensed game feel for a brand new IP. 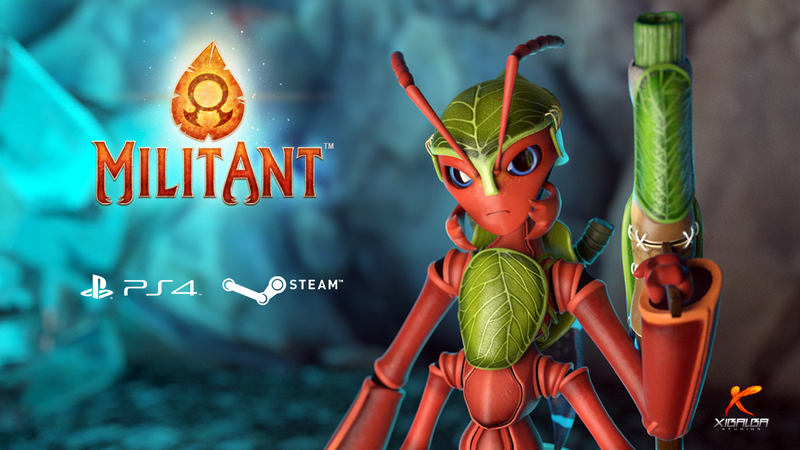 In-game, both your ant-vatar and enemies are much smaller, which is slightly disappointing until you realize all that stuff trying to hit a larger target would make the game impossible to play. For those experts out there, the game’s Ranked mode bumps up the challenge with limited lives and an online ranking board. The rest of you, stick to Unranked play because you probably don’t need the stress of seeing your former high score steamrolled by some mad genius within a few minutes of posting. Overall, Xibalba has made an excellent but truly hard as nails game experience only the best of the best will see the ending to and very likely go back to again and again to beat their best scores. At ten bucks, this one’s a no-brainer must-buy for anyone looking for a big, bug-packed blast. This entry was posted in 2016, Commentary, DAF, Features, Humor, Updates and tagged BUY This Game, Digital Games, Downloads, Holiday Gift Guide 2016, Imports, Indie Games, MilitAnt, PC, PC Games, PlayStation 4, Playstation Network, PS4, PSN, Reviews, SCEA, Sony, VGA 101, Videogame Appreciation 101, Videogame Reviews, Videogame Trailers, Xibalba Studios, YouTube by geelw. Bookmark the permalink.